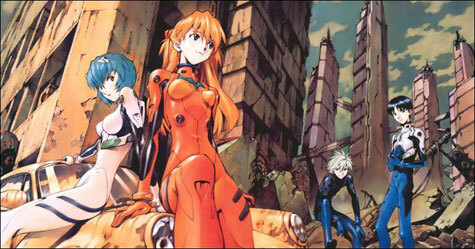 Rei Ayanami, Asuka Soryu Langley, Kaworu Nagisa, and Shinji Ikari prepare for some EVA action. The Skinny: If you liked Neon Genesis Evangelion, you'll probably like Evangelion 1.0. This retelling of the now-classic anime is better-looking and more compact, though not without its own minor faults. Like that'll stop you; if you're a fan, you'll see it anyway. by Kozo: It just won't go away. Neon Genesis Evangelion may not win the award for most prolific or long-winded anime, but few anime properties have seen the sustained popularity that Evangelion has. Originally airing in 26 episodes back in the mid-nineties, this combination of giant robots, shonen action, existential angst and manic-depressive self-flagellation has been over for a decade now. Creator Hideaki Anno did return for two films reworking the original series' famously dense and unsatisfactory ending, but for a good long while, Evangelion has been done. However, massive ancillary sales and fan interest say otherwise, with Evangelion living on in everything but animated form. Books, manga, toys, models, figures, games, etc. You name it, they've made it and stamped "Evangelion" onto it. Only Gundam or possibly Soreike! Anpanman! have more egregious merchandising going on than EVA. That popularity has obviously not escaped the attention of Hideaki Anno and the boys at Gainax. They know what side their bread is buttered on, so they've given in and are producing the Rebuild of Evangelion, a four-film project retelling the now-classic story of Evangelion complete with a compressed storyline, upgraded animation, and - you guessed it - an all-new ending. The first film, Evangelion: 1.0 You Are (Not) Alone is an abridged retelling of the first six episodes of the television series, detailing the arrival of 14 year-old Shinji Ikari at NERV headquarters, his introductions to fellow pilot Rei Ayanami and superior officer Misato Katsuragi, and his reunion with the worst father in the entire known universe, Gendo Ikari. Shinji also discovers that it is his destiny to pilot the sinister-looking EVA-01 against the encroaching alien "Angels", massive interstellar visitors who are bent at doing something not-so-nice to humanity. What are they trying to do exactly? We don't find out in this movie, and anyway, that information would qualify as a spoiler. Fans of the original series should probably run and get themselves a copy of Evangelion 1.0 immediately, because it's everything it promises to be. That is, it retells Evangelion with cool new animation, reintroduces classic characters without a single change to their character designs, serves up great set pieces that are as memorable as the original series, and dispenses tons of borderline pretentious psychobabble as justification for the ultimately depressing emotions. And that's just the tip of the iceberg. The majority of EVA's long-winded exploration into self-worth and existential belonging is reserved for later in the series, though the filmmakers do foreshadow that by delivering more exposition here than in the original six episodes of Evangelion. There's less time to get to know characters in a two-hour film, so the filmmakers use straight up verbal exposition from key characters to get the situations to where they need to be by film's end. The narrative shorthand works, but it's not that exciting, and makes the involved concepts and themes rather obvious. Also obvious is that Shinji Ikari is a major drag. The self-loathing, whiny main character was not new to science fiction or anime when EVA first premiered, but since its debut Shinji has become the poster child for self-pitying anime protagonists. The compressed storytelling allows Shinji to become very annoying very quickly, and doesn't give him the space, both literal and temporal, to help his self-absorbed personality become sympathetic. During the original series Shinji actually got to appear normal sometimes, but since Evangelion 1.0 has to get things going fast, he seems to be petulant and unhappy 24/7. As it is, Evangelion 1.0 comes dangerously close to making him insufferable - a big problem if the intention here is to attract new fans to the EVA franchise. Then again, if Gainax really aimed to attract new fans, would they have included a shout-out cameo to a popular character that didn't appear until one of the final episodes of the original series? Likely not. Even if the character is slated for a much earlier appearance in this "rebuild", the uninitiated may still be puzzled at the appearance. This shows that Evangelion 1.0 is still mostly for established fans of the series, because it's established fans that will look past the dense backstory, copious exposition, and now-familiar concepts that Evangelion 1.0 possesses to see the complex and compelling anime that has yet to show itself in this single two-hour movie. Basically, the hook lies in where they'll deviate from the original, and not where they're going right now. Notes:  The DVD of Evangelion 1.0 has been dubbed Evangelion 1.01 due to a few extra tweaks made to the home video release. Hideaki Anno has stated that 266 shots received minor enhancements, including some adjustments regarding sound, picture, and editing. We read about this at Wikipedia.